In May 2018, Ronnie and I took a 16-day trip around northern Europe. We had several focuses: art, trains, and chocolate!!! The last post was about our first few days in Paris. 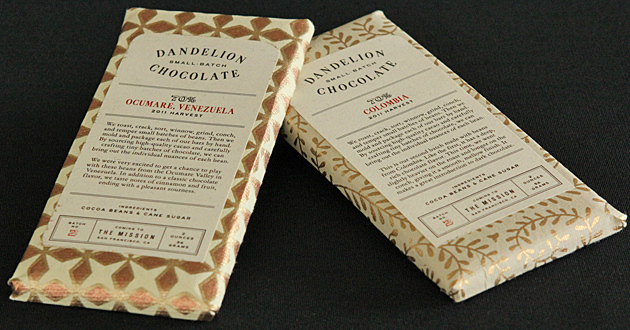 We pick up here with more great chocolate finds. To me, Paris is the art and soul of chocolate since the trip Ronnie & I took to Paris in 2009. It made we wish we had a similar scene in SFBA and was one of the inspirations for this blog. This trip re-affirmed my beliefs and aspirations with more amazing chocolate within easy walking distance of where we stayed. 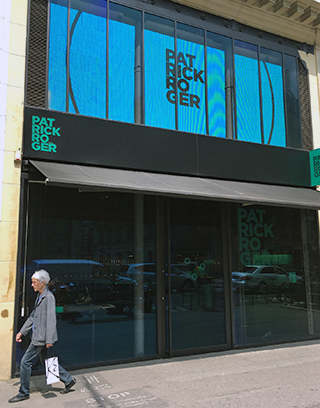 The storefront of Patrick Roger’s Saint-Germain shop looks like it could be an art gallery with its large logo projected overhead. 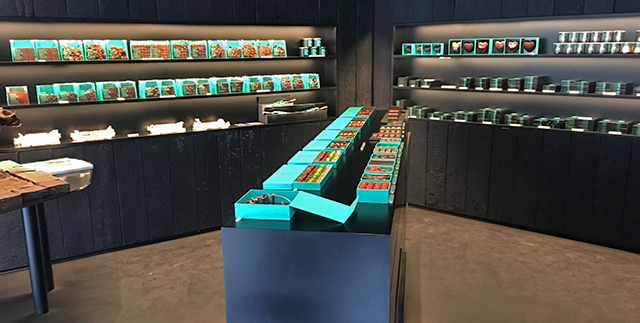 The interior also evokes a gallery or museum with long black plinths topped with beautiful chocolates in bright turquoise boxes dramatically lit from above. It makes sense too, because Patrick is known for his chocolate sculptures, which are displayed in his shops. When we visited, there was a sculpture in the window with a broken overturned wagon and an ox on big uneven slabs of chocolate with the word chomeur, which translates as unemployed person, flying above. He’s not making tourist-attractions here; this is art in which the medium just happens to be chocolate. The shop is intimidatingly chic, but don’t let that stop you. Your basic tourist French is enough to get someone to help you in English. And if you know some French vocabulary for chocolate and other types of food, it’s even easier. We explained to the staff that we wanted more unusual flavors, and he pointed us in the right direction. 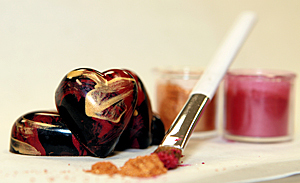 The chocolates were grouped by themes, such as exotic locations or feelings. It might be fun to do set tastings by themes, but this time we picked random flavors that interested us. What we found were very well made chocolates — smooth ganaches, thin-but-not-too-thin shells, understated decorations, and generally subtle flavorings that were supporting, not overpowering, the chocolate. Ones I especially liked included the Audace (boldness), a nice fruity quince jelly and ganache piece; the Delhi, a lime basil ganache, with its bright lime flavor and savory undertone; the Zanzibar, a lemon marzipan & lemon thyme ganache combo, with a subtle lemon flavor and marzipan texture, but no sweet almond flavor (because I am not a marzipan fan); and the light, slightly minty Jacarepagua, a lemon grass and peppermint ganache. Others that were also nice, but even more subtle were the Atome (atom), an oat ganache, which didn’t taste like oatmeal, but was instead very chocolate-y; and the Katmandou, a jasmine ganache, that only tasted slightly floral. The only piece that disappointed me was the Bornéo, a super thin sesame nougatine, that was crunchy with some bend to it, because it was too sweet, like sesame candies. 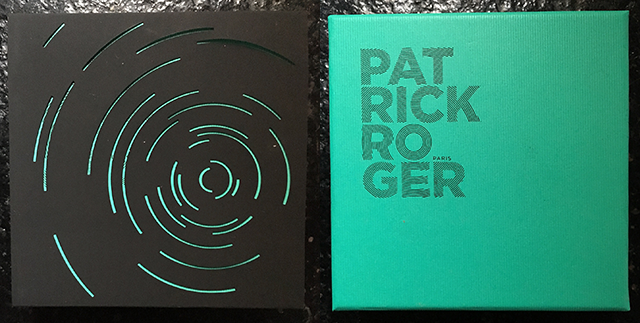 Overall, Patrick Roger’s chocolates are really about the chocolate. If I didn’t know what most of the flavors were, I would have a hard time discerning them over the chocolate because they are so subtle. A couple of pieces we tried were very distinct, though: The Instinct, a crunchy almond praline with hazelnuts, was very hazelnutty; and the Corsica, a chocolate-covered orange peel that was a good balance between dark chocolate and chewy orange peel. One of the things I enjoy about traveling is meeting friends on their turf. 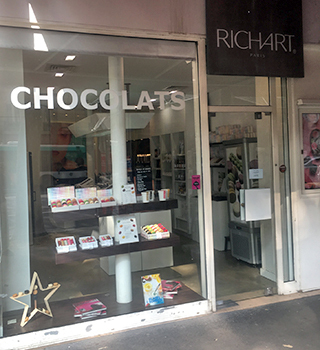 And when we went out to dinner with friends who live in the 17th Arrondissement and chocolate came into the conversation, they recommended their favorite Parisian chocolatier, Richart, which just happened to have a shop in our arrondissement. The compact shop was manned by a single person, who although new to the job was very friendly and helpful. He seemed to epitomize the Richart approach to chocolate, which I’d describe as super-helpful. Forget any stereotypes you may have heard about the French being rude; shop staff everywhere were polite and helpful. But Richart takes it even further. In addition to being chocolatiers, I think they are also chocolateers like us at CBTB: Cheering for chocolate; they want everybody to enjoy chocolate as much as they do. To that end, they offer chocolates as tasting collections, such as a box of 70-100% chocolates to help people appreciate darker chocolate. They have nut-free chocolates for people with allergies, bonbons in 2 sizes (12 grams & 4 grams), macarons in 2 sizes also (the minis are advertised as low in calories), and a cookbook. Their website’s FAQ section includes quite a bit of helpful info about chocolate history, tasting and pairing. We wanted to get a range of Richart chocolates to try, and were steered to the Petits Richart collection, which included chocolates in their Aromatic Families collections: Balsam (single-origins and savories), Roasted (nuts and coffee), Fruits (berries and misc. other fruits including chestnut!? ), Citrus, Herbal, Floral, and Spices. The staff suggested the smaller bonbons as more cost-effective: We could try a larger selection of flavors for a lower cost. Since we bought a lot of chocolate on this trip, we appreciated his thoughtfulness. I don’t know about their other shops, but here we could not buy a custom set of chocolates; we could only get the collection prepackaged. 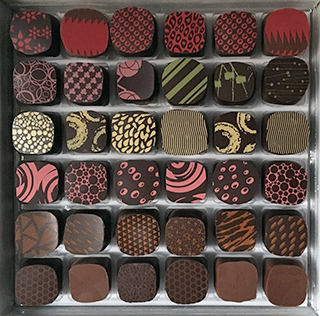 This seemed unusual to me; every other chocolatier offered the option to create custom boxes — in fact, to me that is one of the main reasons to trek to a chocolate shop instead of buying online. I feel like this set-up might be part of the Richart helping philosophy: They will give you what they think is the best sample of their wares for a specific purpose. As with most of the other European chocolatiers we visited, I loved their packaging. Everything is based on a white and silver theme, and while the box was attractive, it was not exceptional. The bag however was cool: A custom cut white bag with silver logo, sealed with a twig. Such a unique, unexpected touch. The petit bonbons themselves were a mixed bag. The pieces were well made with perfect-thickness shells of good chocolate and very smooth fillings. Some pieces were great like the Yuzu Caramel, which was a little tart but not excessively so, with a definitely yuzu flavor. The Vanilla Bourbon Madagascar had good, strong bourbon and good vanilla flavors. The Nutmeg Praline was nice with a little crunch. I think it would be called pumpkin spice in US. The flavor and texture reminded me of sweet potato pie. Two I didn’t like were the Sesame and Raspberry. The Sesame because, like Patrick Roger, it was a sweet, praline-esque filling, instead of a nut-butter texture/flavored ganache. On the other hand, the Raspberry was super tart and too acidic. A sweeter chocolate would’ve helped balance the flavor. 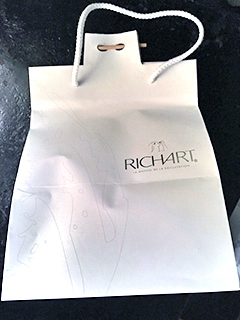 Richart was founded in 1925, and in addition to chocolates, they make pâtes de fruits, macarons, and glazed chestnuts, which I haven’t yet tried but seem to be a common offering in Paris chocolate shops. Before we left Richart’s, the staff provided another helpful service. He knew we were on our own chocolate tour and suggested his favorite chocolatier for us to check out, even recommending what we should try. That personable level of service made me as happy as the chic little bag I was carrying when I walked out the door. Richart, 27 rue Bonaparte, 6th Arrondissement and other locations. I first saw Chapon Chocolatier bars at Chocolate Covered in SF and fell in love with the old-travel-poster themed illustrations that fill the front of the wrappers. Visiting one of their stores to see their entire line was high on my list for this trip, and I was happy to see that the whole store had a similar 1920s-30s vibe. 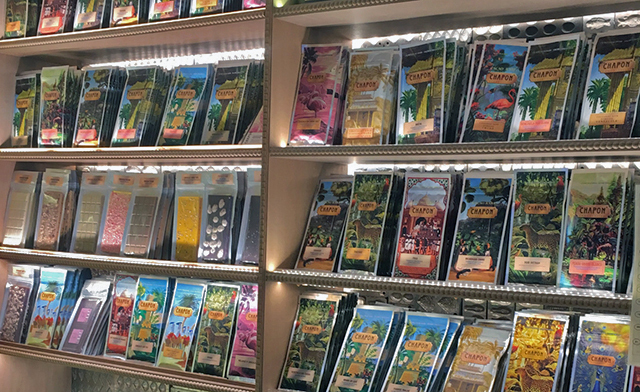 It was a small place but packed with lots of single origin bars, an extensive line of bonbons, gift options (including a colorful logo silk scarf), even coffee beans, plus the Chocolate Mousse Bar™, which is basically a tasting bar of single-origin chocolate in the form of mousse. Since I can taste single-origin easily at home, I skipped the in-store spoonfuls and tried to take in the visual overload that is Chapon. The first thing that caught my eye was a clear plexiglas box of “agates.” These orbs of almond/hazelnut praline are covered in white chocolate and decorated with bright multi-colored patterns that look like old textile patterns. They were just one of the many cute gift ideas there, including a swirly Eiffel Tower box, a mini steamer trunk filled with 4 drawers of chocolates, and a box of emoji-faced chocolates. Of course, the bars in their 1920’s travel ad style wrappers would make good souvenirs/gifts. There are at least 10 different bars, most single-origin. We tried 2: A Cuban (because that was the new origin on this trip) and a Venezuelan (for contrast since that is a more common single-origin). The Cuban had a good snap. It was very hard with a high melt: It took a long time to taste. It was fruity at first, a little bitter, then fermented. Compared to the Venezuelan, it was more savory, darker, not as chocolatey. The Chocolat Noir D’Origine Chuao was made with beans from northern Venezuela, where they grow Criollo and Trinitario cacao (the top 2 types of beans). It had a good chocolate smell, but was surprisingly hard and brittle. Since the Cuban was also very hard, I am going to assume this is Chapon’s preference in tempering chocolate. The Chuao was very fruity, with caramel and nutty undertones. The texture was a little powdery as it melted, but it was creamier and more flavorful than the Cuban. Both bars were good; I’d like to try the whole set of Chapon bars sometime. In addition to bars, we were curious about Chapon’s bonbons. The staff recommended their award-winning Dôme Fondant au Sel. It’s a cute little dome of dark chocolate with glitter dots on top. The crunchy shell contained a not-too-sweet light fondant, which was more of a thick paste than a soft ganache. 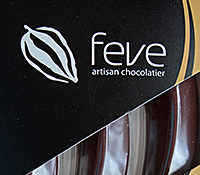 It is very good, and makes me want to try some of their other bonbons. Chapon Chocolatier, 69 Rue du Bac, 7th Arrondissement and other locations. The last chocolatier we visited in Paris was the one recommended by the helpful staff at Richart: La Cacaotier Hubert Masse. 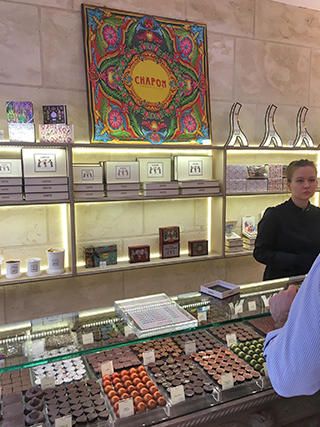 They offer an extensive line of chocolates, plus confections, pâtes de fruits, caramels, and sauces, but one of their house specialties is chocolates made with hazelnuts from Italy’s Piedmont region. Which is exactly what the staff at Richart recommended, telling us he thought they did the best hazelnut chocolates in Paris. We tried their hazelnut chocolates 2 ways: praline and ganache. The praline was crunchy with chewy nougat chips. It had a good hazelnut flavor with a strong shot of dark chocolate. I liked this one best because it was more chocolate than hazelnut and I liked the crunchy caramelized bits. The hazelnut butter ganache was sweeter with a good hazelnut flavor in a smooth milk ganache in dark shell. This had a much stronger hazelnut flavor — if you like hazelnuts, this is the piece for you. We also tried the almond praline for contrast. This one was unusual for a few reasons. First, it was a smooth ganache. When I hear praline, I expect it to be crunchy, but maybe they are using the Belgian definition, which is just a filled chocolate. Second, the praline is made with sweet Marcona almonds from Spain. I always find sweet almond a little weird because I have a distinct flavor in mind when I hear almond, and that’s savory California almond. (Marcona almonds are what marzipan is made of.) And third, it ended with a little smoke. It’s definitely a distinctive piece. 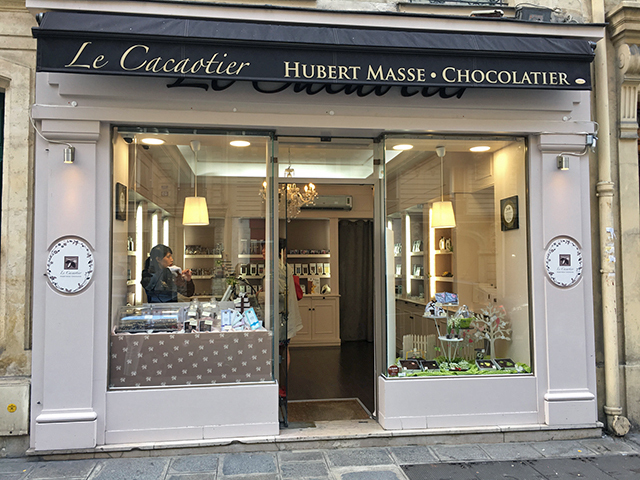 La Cacaotier Hubert Masse, 52 rue Saint-Placide, 6th Arrondissement and other locations. Date posted: November 17, 2018. This entry was posted in Chocolate around the World, Outside the Bay Area, Paris chocolate and tagged almond, basil, candied orange peel, caramel, Chapon Chocolatier, chestnut, chocolate sculpture, Cuba, fondant, hazelnut, jasmine, La Cacaotier Hubert Masse, lemon, lemon grass, lime, Marcona almond, marzipan, nutmeg, oat, oatmeal, Patrick Roger, peppermint, praline, quince, raspberry, Richart, sesame, single origin, sweet almond, thyme, Venezuela, yuzu. Bookmark the permalink.